Whether it’s an apartment building in California or a condo complex in Florida, there’s no such thing as truly free electricity. This rule applies especially to recharging plug-in vehicles, and it will become more and more of an issue as an increasing number of city-dwellers purchase plug-ins. With the prospect of battery-electric or plug-in hybrid vehicle drivers using common-area parking-garage outlets to charge up, Florida’s Naples News sounds an alarmist tone with this article bemoaning how everyone in a condo association will have to foot the bill for such electricity use, whether they drive a plug-in or not. The author says condo association declarations should be rewritten to factor in the “electric vehicle freeloaders.” The idea – which we’ve dealt with before – is to get plug-in vehicle drivers to either pay for the installation of electric-use meters or faster chargers themselves or be billed a monthly surcharge for estimated juice use. And, if there’s a plug-in car-b-cue, the owners should be held financially responsible for the damage. But what if there’s another way? 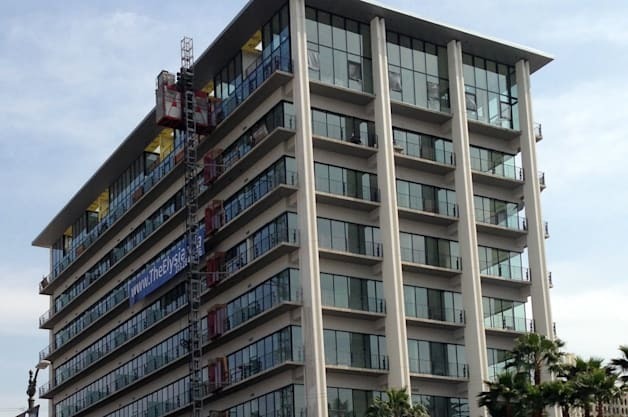 The way that the developers of the new Elysian apartment building near downtown Los Angeles are addressing the “problem.” Developer Linear City is installing 20 fast charging stations in its new 96-unit building. Rent for the apartments costs between $1,500 and $6,500 a month, with a parking spot adding $100 to $150 to the cost, whether there is a charger there or not. Len Hill, a partner in the Linear City project, said in a statement that, “By making parking optional to the lease, we’re broadcasting to residents that it might not make sense to even own a car.” There will also be a car-sharing service located on-site. Check out Linear City Development’s press release below for the fine print.